Buffalo Bills tickets and travel packages are now on sale with PRIMESPORT, the Official Hospitality, Gameday Experience and Fan Travel Provider of the Buffalo Bills. Take your Bills pride to the next level this season with an Official Bills Fan Package from PRIMESPORT. 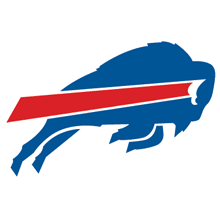 Get the latest Buffalo Bills offers! If you're looking to buy Bills tickets and need a little something extra to go along with your seat at New Era Field, check out our Buffalo Bills ticket packages. Browse through the Bills 2019 schedule for the home game you wish to attend, and click buy to select your Buffalo Bills tickets. Included with your ticket to the game is an exclusive pregame field pass that will gain you access to the turf at New Era Field prior to kickoff. Experience the stadium and gameday environment from the players' perspective as you watch your favorite Bills stars in pregame warm-ups. We know that there are Buffalo Bills fans spread out across the country, and we wanted to make sure that there was a way that those dedicated supporters could grab a Bills ticket as well as a place to stay. For Bills home games, this means an Official Bills Travel Package with a two-night stay at the Hyatt Regency Buffalo, as well as the pre-game field pass, souvenir, and of course, tickets to the Bills game. PRIMESPORT is the Official Hospitality, Gameday Experience and Fan Travel Provider of the Buffalo Bills. The terms NFL® and Super Bowl® are trademarks of the National Football League. PRIMESPORT is a division of On Location Experiences.